Polish physiologist and physician; born at Warsaw 1855. He studied medicine at the University of Warsaw, and received his doctor's degree from the University of Kharkov in 1884. From 1876 to 1887 he worked in various laboratories and clinics in Europe: at Berlin under Dubois-Reymond; at Erlangen under Rosenthal; and at Paris under Charcot and Mars of the Collége de France, where he was for some time assistant also. Since 1890 he has been privat-docent in physiology in the University of St. Petersburg. 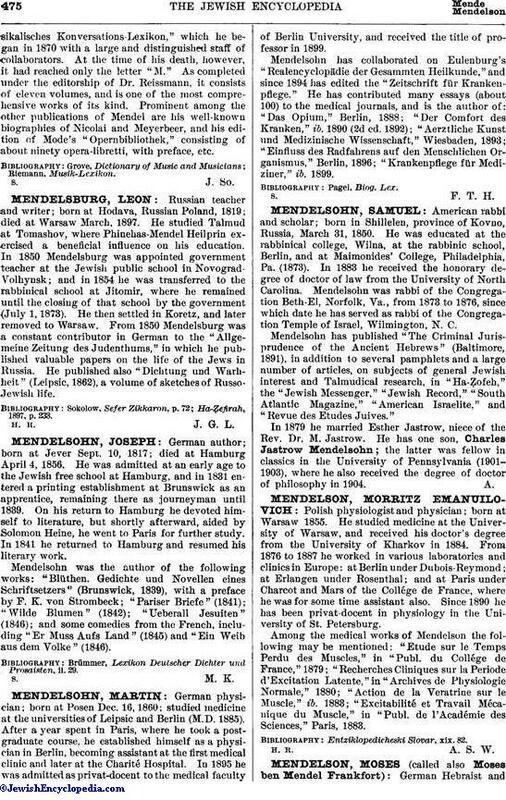 Among the medical works of Mendelson the following may be mentioned: "Etude sur le Temps Perdu des Muscles," in "Publ. du Collége de France," 1879; "Recherches Cliniques sur la Periode d'Excitation Latente," in "Archives de Physiologie Normale," 1880; "Action de la Veratrine stir le Muscle," ib. 1883; "Excitabilité et Travail Mécanique du Muscle," in "Publ. de l'Académie des Sciences," Paris, 1883.